Independant from the other buildings in the complex the 2 bedroom gite is really fantastic. Attractive and inviting terrace area adjacent to the pool leads guests in the main lounge area which has a beautifully restored fire place with a wood burner. The gite has free view satellite TV and also dinning for four people. Leading away from the lounge access can be found to the downstairs bath and shower room which is tastefully decorated and also to the double bedroom which is cosy. Upstairs is where guests will find the main feature of this gite, the second bedroom. This isn't a double bedroom it is an entire floor which has been fully restored. There is a free standing bath tub, low ceilings and exposed beams and soft lighting and furnishings which really make this room stand out. Guests will love this room, it is simply perfect in every regard. Recently refurbished to a very high standard our family Gites are bound to delight all our guests. The property is located at Le Moulin du Clapier which is a 400 year old former french manor house just on the outskirts of Sorges village which is 17km from Perigeux, the capital of the Dordogne and 15km from Thiviers. This makes the property as an ideal choice for visitors with all local attractions within easy reach therefore location couldn't be better. Within the complex of the old Manor House there are two Gites available for Holiday and long term rentals. Both gites are independent from one another allowing privacy between families. The gites have outdoor dining including BBQ, a 8m x 4m heated swimming pool (to 28 degrees) and is situated in the beautiful grounds of the former manor. The pool is a shared space between guests of both gites. There is a choice of either 2 bedroom or 3 bedrooms within our gites. Both are fully equiped with fitted kitchen, dinning and lounge area with wood burning stove, and Satellite TV ( there is UK or French freesat available). In both gites there is also a double bedroom downstairs with beautiful views looking out on to the terrace and pool area. Within the grounds there is a large netted trampoline, a slide and swings to keep the kids entertained should they tire of the pool. Situated around the pool is a large terraced area with loungers and umbrellas should shade be required. The property is within walking distance (less than 10 mins) to the local village of Sorges where the local bakery, supermarket and other shops can be found. The village of Sorges is famous for it's renowned Truffles which is claims are the best in the Dordogne if not in France. There is a local Truffle Museum in the village to celebrate this fact. The back of the grounds (1 hectare in size) lead on to farmers fields where in the summer months you can stroll through country lanes between the corn fields (all trails are marked and are popular with Walker - approx 50km in total). This really is a beautiful property in a fantastic location and guests will be delighted when they stay here. In terms of local airports both Limoges and Bergerac are under 1hr and Bordeaux is a little further afield at 1h30mins. Louise and Mike are married and have two children Emily and Lucy. Originally from the UK and now living in France for just over 10 years. Both Louise and Mike compete in Triathlon and have a love for the outdoors and everything to do with sport, and health & fitness. This is the house you would draw when you were a child. It is perfect in every respect and we immediately fell in love with it and knew we would buy it without even seeing it. We bought it as a project and between working in Switzerland full time we have gradually been "doing-up" and renovating the property and the grounds. Our goal is to provide the best possible Holiday experience for our guests in a location which is calm, tranquile, and idillique. The countryside, the peace and quiet, the friendliness of your hosts, the accommodation, the vast garden, outdoor dining, safe for kids to play, the rabbits that freely run around the garden.......plus much more.....! Net to clean pool(we did ask for this a few times and still didn’t appear). Pool was only cleaned once in our two weeks stay. Not nice swimming with dead/live bugs and leaves. More comfy seating in lounge for 4 adults as dogs only just about seats 3 people. Clean bed linen and fresh towels would have been nice on the 2nd week. No spare black bin liners. No info on where to recycle. No info on anything to be honest. Pool alarm kept going off even when no one was in pool. Info on surrounding area would have been useful. Couldn’t open bedroom window, couldn’t lock kitchen window(at least the shutter was lockable for safety). Open square holes in upstairs bedroom where flying and crawling bugs/insects invited themselves in. Welcome pack of bottle of water and maybe some croissants would be nice instead of bottle of wine(not everybody drinks wine). No info to let you know if tap water was safe to drink. Apart from all of the above the holiday was great along with the weather. Unfortunately the owner was unable to greet us so we never met in person. 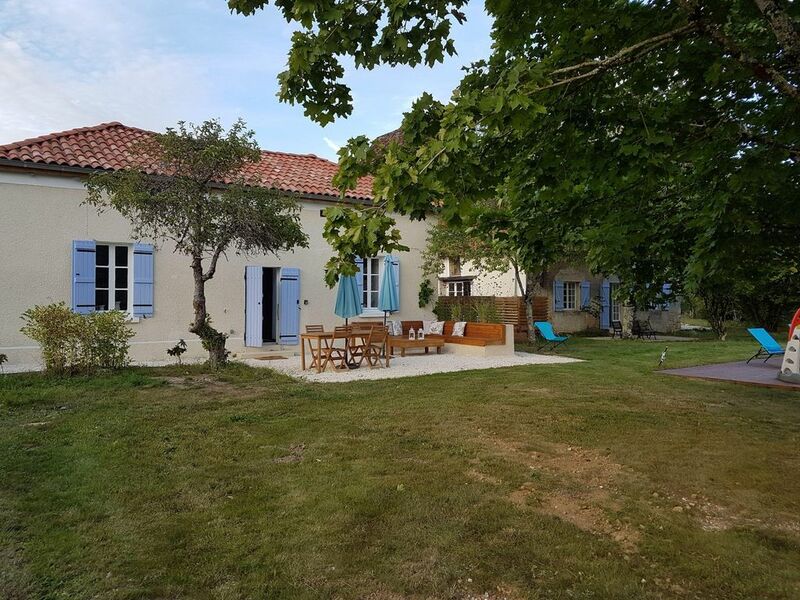 A charming gite in a rural setting but near a village with all the facilities you need. This two bed gite which shares a pool with another is in the heart of the Perigord and not far from Perigueux. We had a two week holiday which we thoroughly enjoyed and explored the area and it’s charming towns and cities. A very restful break with just a few bumps from the low beams in the upper bedroom. We spent nearly two weeks at the lovely Moulin de Clapier and it was a treat. The owners Mike and Lou were lovely and spent considerable effort getting the property ready for us after a large storm created some havoc just before we arrived. The facilities are great. A full size bathroom was great for messy kids, and the lovely parents retreat upstairs is very nice. Our two young kids loved the pool and they spent a lot of time swimming which was great entertainment for all of us. We cycled with them up the paths behind the property to the village to visit the boulanger. There are many trees to climb, and swings and slides and a big trampoline. And the convenience of a football pitch next door meant we had a proper set of goals all for ourselves! We made great use of the BBQ too! The location is great. We visited most of the local sites, including the magic Perigueux, Chateau Hautefort, Grotte de Villars, St Jean De Cole, Brantome, Lac Nuefont, Montignac and Sarlat. All were pretty easy, although Sarlat is a long day out for the kids but totally worth it. Supermarkets are not far away either, especially the enormous LeClerc in Trelissac which is overwhelming but has lots of cheap wine to make it worthwhile! The only issue we had was the road, and the only reason this is not a 5 star review. The D8 runs right next to the gite and can be quite busy and loud, and we did feel a bit exposed to people looking in from traffic. But the kids didn't mind and enjoyed watching loaded tractors and combine harvesters trundle past, waving to the drivers! Good location as it is near Perigeaux. The gite is of high standard and we have 4 adults which was fine. If you are staying in this region then this is a perfect place. Local town has a Co-op, bar and boulangerie and only 10 minute walk. The owners Mike and Lou are very helpfull and nice people. The gite was restaurated in a fabolous way: the old atmosphere was still there despite all modern equipment is available. The ceiling where we slept was very romantic with a lovely bath. Leaving the garden at the end you can start walking for hours enjoying the great landscape. Backery is only 5 min driving. The beautiful town Sarlat is worthwile visiting. Not that much to do in the direct neighbourhood, but when you like an easy stay you should really go here. A firm favourite - we will be back! Our second visit to this property, it keeps on getting better! This is such a peaceful location but never feels too far from things to do, so many places to go for days out. The house has been renovated to a very high standard, comfortable beds and quality fittings. The pool is kept at a lovely temperature and is great for youngsters, our son spent so much time in there and there are sun loungers and sun shades around the pool. There is a trampoline and a small slide/swing for the kids too. The local village is about 5 mins walk and has a great boulangaie and smallish supermarket. For our main shopping we used the Intermarche in Perigeux, about 15 mins drive away. Periguex also has a great food fair every Wednesday through the summer months and is well worth a visit, there's also a great pool (Aqua CAP) with slides both indoor and outdoor. We visited Brantome several times each visit, such a beautiful town, be warned though the restaurants get very busy, La Guinguette is a favourite of ours. Another great day out is to Sarlat, another beautiful town, there are so many within easy reach of this property!! We tried canoeing on one day, and explored caves at Grotte de Villars another. One great feature of this part of France is the man made beach/Lakes, there are a couple within easy reach of Sorges, the closest probably being Plan d’eau de Nantheuil, safe fun and swimming for the kids, and another at Ruffiac. The owner can provide details of all these locations and many more. There's even a fitness trail that runs behind the property, although this is a bit overgrown (assume it's a local council run thing), it's still accessible, I ran round it most days. The property has good wi-fi and there was a BBQ for us to use. We've already booked for our third visit, and we're bringing more family with us this time!! Cycling is great locally too the roads are very quiet. In summary, a great property in a great location well hosted.